Currently, there's a pretty low number of maps. It weighs in at ~3950 bytes, so there's a bit of space for more maps (at least low-poly maps). Might replace some of these maps, too. I'm not doing injection so that just might decrease size further, at least for the maps? - Left click to fire yellow rope, right click to fire red rope. - Z and X fires yellow/red ropes too, for mac users. - Alternatively, holding CTRL lets you fire the red rope with left-clicks. - Q and W to skip levels backwards and forward. - L to load a map. - Map editor has instructions in the editor window. - In the replay version, press A to save a replay when it says "click to begin", and A to load when in a game. Above are screens of the game and editor. As always, any comments or thoughts are appreciated and very welcome! UPDATE2: I've altered key firing. Now holding CTRL lets you shoot the red one with left-mouse, yellow is fired as usual (left-mouse with no key). Also, I've added Q and W for level skip. UPDATE3: I've added a link to the version with replays, added a timer to both versions, and added a link to the game's website. Thanks to Laundon for website backend (map preview generation and stuff like that) and the very awesome replay functionality! UPDATE4: Z and X fires the yellow/red ropes respectively for macs (ctrl+mouse works too). Also, one new map, level 10 (tricky one!). maybe you could limit the amount of shots per level so you can't advance in micro steps or reward the player with a bonus score for not using all shots. Really nice game. Captures the spirit of Gish! Regarding the small steps, I think it's okay - most people seem to think it's too hard as it is, but I don't know. Have to test the editor now. Very nice. One option you could add to the map editor is the ability to clear the entire level to start over. Try this map. I was able to complete it by luck. Also, you can "sort of" clear the map. Just press L and load an empty string, it'll reset the whole thing and say "could not load map". The second one was really good. With your permission I might add it into the game. Good stuff! Just one thing, I try to keep it so that the ball will always start out attached to something (never falling towards its death in the start). Dunno. Thanks. You can use any of the levels that you want. Yeah, I was thinking about that first one, but left it with the spider falling because the ball is close. Some of the balls in number 5 were to just provide an obsticle. Do the rocks move after a level starts? I have some rocks placed in a specific spot, but some of them don't end up where I placed them. Yes. All rocks have a speed of "1", which is... pretty slow, to the right, when they start. They then gradually slow down and stop. Should I alter this behaviour? I'm uploading a new version with overhauled levels 1 and 2 (easier, I hope), and two new levels. One is mine, one is a slightly altered version of a level CaptainJester did. I also changed key behaviour (now holding CTRL works as a modifier that lets you shoot the red one with mouse1 instead of the yellow). Also, I added Q and W - level skip keys, backwards and forward respectively. There seems to be quite a few people that suggest adding time limits, timers (for speed runs) or limited number of shots? Personally I'd think a timer was okay but only for high-scores, not limits. What does everyone think? It is up to you if you want the rocks to move. The level still works. Definitely keep the flying behaviour. Got another level for you. There are a couple of graphics glitches I can't fix, but maybe you can. As you may or may not have noticed, old maps are slightly altered - this is because I had a bug that displayed maps differently with different window layouts. I've fixed this, but it led to some maps being slightly broken (not very much for the most part), and I've updated the 9 official maps accordingly. I've also replaced level 1 with an easier map. There's also a version with replay functionality, but it's some 4350 bytes. I'll try to squeeze it down but if I can't, I'll put it up too as a non-4k version (because speed runs are fun!). Wondering if you did it that way? I'd suggest trying with quadratic, or cubic curves to get rid of all those hard edges - it might even allow you to reduce the poly-count on some of the levels. EDIT: Cool stuff, all those maps added to the site CaptainJester! Keep it up! I have had a thought which might help shrink the sizes of embedded levels. Instead of storing each vertex exactly, why not attempt an approximation? 4. compare each pair to the corresponding vertex. Maybe using the squared difference. 4a. if the total squared difference of all the pairs is currently the minimum then store the random seed. 1. Create a Random instance set to the stored random seed. 4. these pairs are the vertices and thus use them as usual. With larger levels with more vetices you might need to break it up so each random seed can produce a max of say 10 pairs otherwise the error might be too large and the result not representive of the level. Hm... that's a very interesting thought. It might slow down the level editor process some, but it should decrease map size and map loading times. It has a rather unexpected side effect; I'll explain by first explaining the current format. 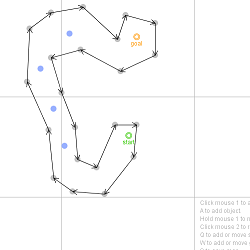 A map currently looks like "hexstring,hexstring". Both strings are divisible by four. Every four characters is a coordinate pair that ranges from 0-255 x, 0-255 y. These are then multiplied by 16 ingame, to increase the level size. Thus, I'm sacrificing precision to decrease level size. The first string consists of n pairs of coordinates for the polygon, then two pairs of coordinates for start and end. The second string holds all the moveable objects on the map. A side effect of this storeage method is that any coordinate in the level editor is rounded down to the closest multiple of 16. This allows for entirely straight lines for the polygon, which in turn lets you make lines with no width (that you can pass) to smaller polygons within the polygon. Due to how polygons behave when its lines cross each other, the new polygon will count as "outside" the first one. 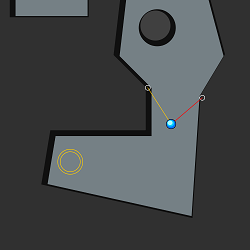 The collision checking in the game is done using a simple Polygon.contains(int x, int y), and so my method allows for caves with obstacles without having more actual polygons. Of course, it'd be better to support several polygons, but as it is I'm only checking whether the player is outside the polygon or not. With more polygons, I'd have to check whether the player is outside the first polygon, and inside the rest of them, so I'd have to keep track of polygons seperately. This could be replaced by subtracting the main polygon from an Area, but that would instead decrease performance. This game is so addictive!! I hope you can fit it into 4k. It reminds me of the 4k submission bullets a little. It was awesomely rewarding to finish the game, and i just wanted it to go on forever. Has the same sort of addictive fun as Portal!! Wow, this is a lot of fun, I can't believe I haven't tried this before now. Excellent game, good job. New version up. I've added Z and X as keys representing mouse1 and mouse2 again as an option for macs (Ctrl+mouse still works too). Also, one new map (lvl 10 - tricky one! ).